Click here to pre-purchase meals. It’s here and we want you to be a part of it! Our launch dinner for Uncle Beres Jerk Marinade is happening! We will be in a few markets early summer, but we want your help spreading the love! Join us for a community dinner or take yours out for dinner later on. Choose between Eating in or Take Out….as well as Chicken, Pork, or Combo…FYI this is Jamaican style so there will be a bit of both white and dark meat chicken. Trust us, it’s so good you won’t care! Can’t make it? You can still be part of our mission. Not close by or cannot make it to our launch event! 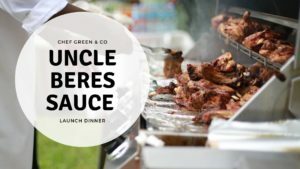 Pay it forward by Partnering with us to help us launch our soon to be famous Uncle Beres Jamaican Jerk Marinade (we will be using these funds to buy the major supplies we need for the farmers market) & Give back to a program we are passionate about, Groundswell Cafe’s Pay it Forward Meal Program. © Copyright 2017 Matthew 25. Site designed and donated by Geonetric.